Availability of and adequate accessibility to freshwater and energy are two key technological and scientific problems of global significance. At the end of the 20th century, the deficit of water for human consumption and economic application forced us to focus on rational use of resources. Increasing the use of renewable energy sources and improving energy efficiency is a challenge for the 21st century. Geothermal energy is heat energy generated and stored in the Earth, accumulated in hydrothermal systems or in dry rocks within the Earth’s crust, in amounts which constitute the energy resources. The sustainable management of geothermal energy resources should be geared towards optimization of energy recovery, but also towards rational management of water resources since geothermal water serves both as energy carrier and also as valuable raw material. Geothermal waters, depending on their hydrogeothermal characteristics, the lithology of the rocks involved, the depth at which the resources occur and the sources of water supply, may be characterized by very diverse physicochemical parameters. This factor largely determines the technology to be used in their exploitation and the way the geothermal water can be used. This book is focused on the effective use of geothermal water and renewable energy for future needs in order to promote modern, sustainable and effective management of water resources. • the development of balneotherapy. The book is aimed at professionals, academics and decision makers worldwide, water sector representatives and administrators, business enterprises specializing in renewable energy management and water treatment, working in the areas of geothermal energy usage, water resources, water supply and energy planning. 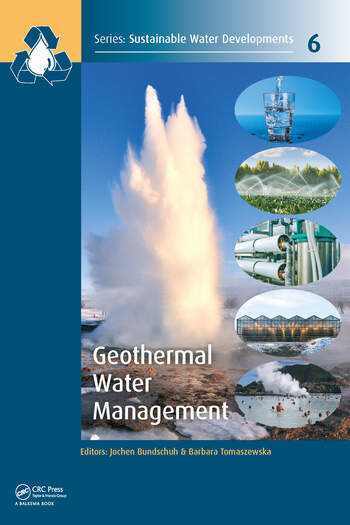 This book has the potential to become a standard text used by educational institutions and research & development establishments involved in the geothermal water management. Prof. Dr. Jochen Bundschuh (1960, Germany), finished his PhD on numerical modeling of heat transport in aquifers in Tübingen in 1990. He is working in geothermics, subsurface and surface hydrology and integrated water resources management, and connected disciplines. From 1993 to 1999 he served as an expert for the German Agency of Technical Cooperation (GTZ – now GIZ) and as a long term professor for the DAAD (German Academic Exchange Service) in Argentina. From 2001 to 2008 he worked within the framework of the German governmental cooperation (Integrated Expert Program of CIM; GTZ/BA) as adviser in mission to Costa Rica at the Instituto Costarricense de Electricidad (ICE). Here, he assisted the country in evaluation and development of its huge low-enthalpy geothermal resources for power generation. Since 2005, he has been an affiliate professor of the Royal Institute of Technology, Stockholm, Sweden. In 2006, he was elected Vice-President of the International Society of Groundwater for Sustainable Development ISGSD. From 2009–2011 he was visiting professor at the Department of Earth Sciences at the National Cheng Kung University, Tainan, Taiwan. Since 2012, Dr. Bundschuh is a professor in hydrogeology at the University of Southern Queensland, Toowoomba, Australia where he leads the Platform for Water in the Nexus of Sustainable Development working in the wide field of water resources and low/middle enthalpy geothermal resources, water and wastewater treatment and sustainable and renewable energy resources. Dr. Bundschuh is author of the books “Low-Enthalpy Geothermal Resources for Power Generation” (CRC Press/Balkema) and “Introduction to the Numerical Modeling of Groundwater and Geothermal Systems: Fundamentals of Mass, Energy and Solute Transport in Poroelastic Rocks”. He is editor of 16 books and editor of the book series “Multiphysics Modeling”, “Arsenic in the Environment”, “Sustainable Energy Developments” and “SustainableWater Developments” (all CRC Press/Balkema). Since 2015, he is an editor in chief of the Elsevier journal “Groundwater for Sustainable Development”. Dr Barbara Tomaszewska (Poland, 1971) finished her PhD degree in 2001 at AGH - University of Science and Technology in Krakow, at the Faculty of Geology, Geophysics and Environmental Protection. She has conducted a broad research into area of changes within the aeration zone in the soil and aquatic environments under the influence of atmospheric pollution and migration of contaminants from landfills. What has been presented in her thesis is the spatial and temporar change in the quality of groundwaters and pore solutions study, focusing on specific indicators of pollution, including fluoride and boron ions, alongside with chlorides and sulphates. Since 2001, she worked as the senior geology and environmental inspector at the Mining District Authority in Krakow where she was working as supervisor of mining operations in the Malopolska region until 2007. During that time, she had an opportunity to gain further knowledge about the practice of underground, open-cast and well-mining operations. In 2007, Dr Tomaszewska joined the Department of Renewable Energy and Environmental Research at Mineral and Energy Economy Research Institute, Polish Academy of Science (PAS MEERI), Krakow, where she helds until now an independent researcher position. In 2012, she was elected to the Institute’s Scientific Board. Her full specific research interests include: 1) monitoring the soil and aquatic environment and the assessment of the chemical condition of groundwaters, according to spatial and temporal perspectives; 2) the occurrence and consequences of increased boron concentration in water; 3) stability of the chemical composition of health treatment waters; 4) the impact of geological studies on the occurrence of health treatment and thermal waters; 5) forecast and prevention of clogging in geothermal systems; 6) sustainable and efficient management of mineral resources as well as groundwaters maintaining the state of environment; 7) treatment of geothermal waters using selected membrane processes; 8) legal regulations in geology and protection of environment. Barbara has been an author or co-author of five large volumes, including a role of an editor or co-editor of two of them. One of these volumes was awarded by Rector of the AGH - University of Science and Technology in Krakow. She has also contributed, or cooperated with other authors in publishing 14 chapters of larger publication and 54 papers for journals with national and worldwide availability, she has joined as well domestic and international conference proceedings.